A lot of moms talk about wanting the day off and I'll be the first to say, heck yes, I want a day off, but not today. 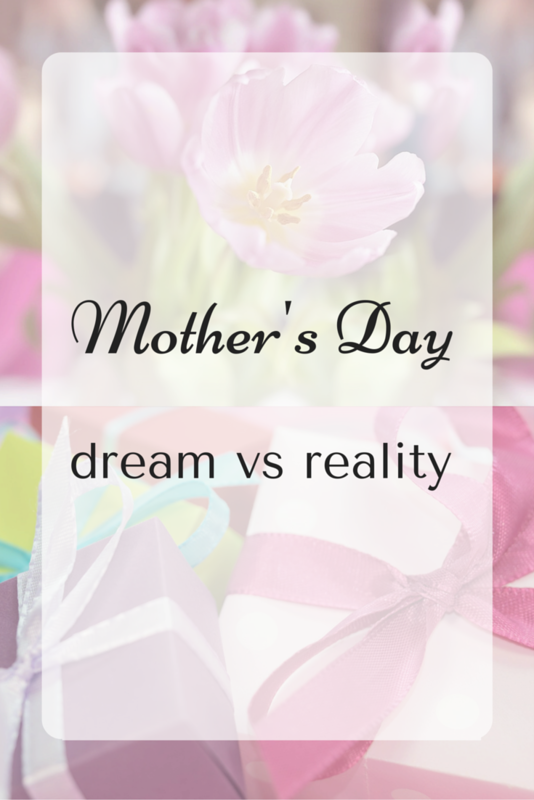 Today marks the day, the one day a year that we set aside to intentionally celebrate moms. Today I want to spend the day with the people who made me a mom. Yes, it's a day for me, but how can I properly cajole without my husband and kids. Don't get me wrong, I want need a day off, but let's do that another day (tomorrow would be ideal). That being said, things never quite turn out the way I picture them in my head. 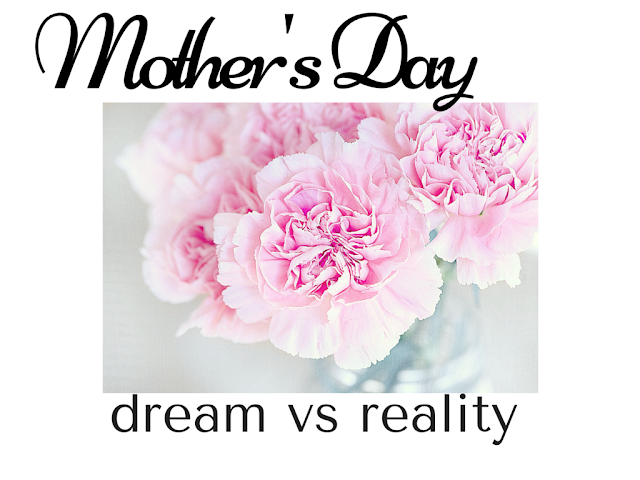 So today, purely for entertainment purposes I'm sharing my dream Mother's Day vs the reality of what Mother's Day will look like for me. Enjoy lol. It begins the night before (as all good celebrations do: Christmas Eve, New Year's Eve, Mother's Day Eve?). 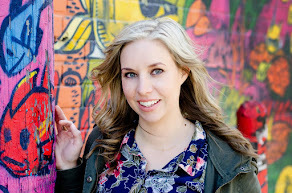 The kids go to bed with ease (ha) and my husband and I put down our phones, have a glass (okay, a bottle) of wine and try and catch up to our massive list of recorded shows. The children sleep through the night. BOTH of them. No one wakes up until 7am (HA). That includes me. I sleep through and don't wake once to go to the bathroom (this is a dream after all, go big or go home). When the kids do wake, both smiling and laughing, my husband jumps up immediately, tells me to stay in bed a little longer, then get ready because we're going out. Once I'm up and ready I come downstairs to find the children both impeccably dressed and Mr. B looking handsome as ever. All the kid's supplies are packed up and ready to go and all we have to do is get in the car. We have an amazing breakfast and both children are obviously well-behaved the entire time. Not even one threat of timeout to be had. Perfection I tell you. After breakfast the little man has nap, a 2 hour one, the rest of us chill, quietly and with coffee (okay, maybe not for mini-me, as if she needs it). Little man wakes up happy (again) and Mr. B BBQs us all lunch and offers to clean up (how gracious). We take a walk to the park and on the way mini-me surprises me with a bouquet of fragrant dandelions. Awww for me?! Everyone takes a nice long nap. Every. One. Even me. Especially me. I nap the longest. Dinner time arrives, we have something delicious, not quite sure what, but whatever it is miraculously requires little prep and no cleanup. My kind of meal. And dessert, it's the best dessert I've ever had and naturally low in calories and fat. Super. I receive a handmade card from my littles with a little note of appreciation from Mr. B. Heart melts. Mr. B offers to bathe the children and get them ready for bed while I sit on the back deck in the warm setting sun reflecting how beautiful a day it's been (with wine). The kids are tired and go to bed early and with ease (to sleep through the night again, of course). Mr. B and I stay up, but not so late that we'll be tired the next day, and enjoy each other's company and wine, always wine. Mother's Day Eve will include bath-time, followed promptly with arguing with toddler: yes, I know the sun is still out, it's still bedtime. I KNOW it's not dark, still bedtime. GO TO BED. I will likely try and get caught up on blog stuff (but I'll get sucked into a Facebook time warp and accomplish NOTHING) while Mr. B watches sports and plays on his phone. There's still wine involved and we randomly chat across the room to each other (and obviously, while I'm "working" I have to interrupt him to show him the funny YouTube video I happened to find). Little man wakes up between 3 and 4, hungry, I prep and give him a bottle and put him back to bed. 6:15am - both minions promptly rise, little man squealing to be freed from his crib and mini-me carrying all the toys into our room. ALL. THE. TOYS. And her blanket and pillow because, you know, we don't already have 6 pillows in our bed. We snuggle in our bed until our growling tummies suggest we ought to figure out what we're eating. We venture out to breakfast. It seemed like a good idea to go out for Mother's Day.... to EVERYONE in the city. We wait in line with starving children. It's a lot of fun. We have a great meal with a few minor incidents (little man pulling all the utensils on the floor, mini-me spilling her smoothie, Mr. B adding spoiled creamer to his coffee). We leave with bellies full and a tired little man. Little man naps. The rest of us chill, though more loudly than in the dream version... in fact, there's a lot of "shhhhh you'll wake your brother"... she cares not. Carry on. Lunch time. Mr. B chose hot dogs primarily because he loves hot dogs and there's little cleanup. He insisted he chose hot dogs because I haven't had them in forever. Who am I kidding? I'm totally cool with this decision. Don't judge me. We take a walk to the park. Both kids eat more sand than I'm comfortable with (fingers crossed it was "clean sand"... what do I even mean by that? Lacking pee or poop? Sure, let's go with that) and mini-me pitches a fit when I tell her it's time to go. Tantrum ends when I tell her she can have a popsicle when we get home. Popsicles cure everything FYI. Little man naps and despite being sooooo tired, no one else does. Mini-me is on edge the rest of the day because, no matter how much she fights it, she still needs a nap (good thing she always naps at daycare). Dinner time rolls around and we realize we didn't take anything out. Whoops. Takeout? We order pizza which is delicious but kills my stomach (worth it, so worth it) but mini-me hardly eats any even though she's been requesting pizza ALL week. Little man has a separate dinner because no dairy, he's grumpy because I think he intrinsically knows what he's missing out on. Sorry dude, it's good, it's so damn good. Bath time. The kids have fun, Mr. B and I get soaked. More water ends up on our clothes and the bathroom floor than I thought I even had in the tub. Weird. Bedtime battles begin but thankfully, mini-me falls asleep fairly quick (because no nap). 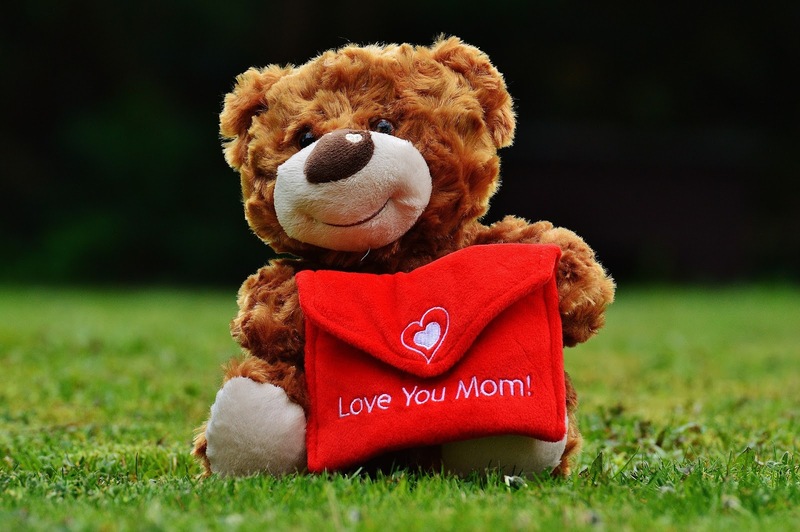 Here's the thing: no matter how Mother's Day looks, no matter how many 'incidents' there are, this is my life and I'm so very grateful for it. Sure, I can dream of a perfect day but looking back, most days are pretty damn good. I have beautiful, healthy children and a husband who works hard and who loves spending time with us. My actual day will likely be filled with smiles and laughter and love and any day like that is one I am happy to reflect on. And wine, there will be wine so that's a plus. I wish you a wonderful Mother's Day, and even though it might not be your ideal day, may you be able to look back and see how perfect it really is. 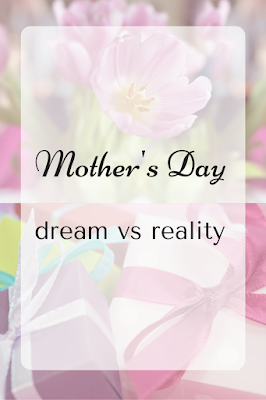 What's one thing you're wishing for this Mother's Day? ?